BIR (radiance configuration) in protective frame with cableBiospherical Instruments’ BIC, and BIR multichannel radiometers are scaled-down versions of our widely used profiling radiometers. The BIC features a cosine irradiance collector and the BIR features radiance collection optics. Both radiometers measure in four wavebands selected from over 20 10-nm wide wavebands ranging from 305–875 nm and PAR. In addition to measuring radiance or irradiance, the instruments can optionally be equipped with sensors for water temperature and pressure/depth. Compact and lightweight, the instruments feature a dynamic-range greater than 5 decades and are suitable for a wide variety of aquatic applications, including general purpose irradiance profiling, spectral transparency, or deployment in shallow ponds and streambeds. 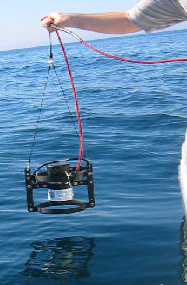 These sensors have been used as profiling systems powered by a PC’s USB port, and have been integrated into buoys deployed in lakes and oceans using external data loggers. If you are ordering a BIC or BIR for use with a PC, you will need the USB DSM. This device is a “junction box” that allows 1 or 2 BIC or BIR cables with sensors to be powered and interfaced to the PC’s USB. This is used for a single BIC or BIR, or can be optionally configured to support a BIC as a surface irradiance sensor on one cable with a BIC and BIR on the other cable suitable for lowering into your aquatic environment. 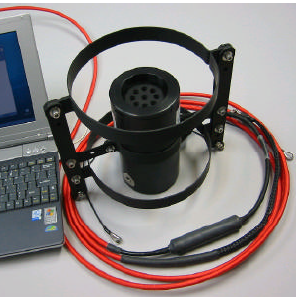 By configuring the BIC underwater with the optional temperature and depth sensors, vertical profiles of the apparent optical properties can be easily obtained. Systems like this have been successfully backpacked into remote mountain locations for use at alpine lakes across the country.